Ransomware is the type of virus or malware. It prevents users to access their device, files or applications. To regain the access of system, victims have to pay a ransom i.e money or crucial information. Most of the organization keep their crucial information in the Office 365. Therefore, it is very necessary to protect Office 365 from ransomware attack. Office 365 has multiple integrated features which protect it against the malware. However, Users are still affected by the ransomware attacks. There are several reasons for this ransomware threats. Such as, when users visit any website which is infected with ransomware or opening an email attachment that is infected with ransomware. So, in this article, the solution for Office 365 Ransomware protection by taking prior Office 365 Backup to protect Office 365 data from Ransomware attack in any organization. The easiest method to trigger a ransomware attack is social engineering. It requires tricking an end user to open an email that has ransomware and malicious code. The ransomware attacks will masquerade as the link to software updates or as macros. Compromising the password of users or PII, and acting as an authorized user is a common technique for hackers to find a way into the organization. Once an organization’s system has been broken. Then, ransomware virus is built to expand quickly and locking down as much of your system as possible. Ransomware can search critical files locally, on the network, and in the cloud. It contacts command and control services. After that, it can utilize access to spread it to other devices. With Office 365 and other cloud application, ransomware can easily transmit through sharing. Moreover, collaboration tools like SharePoint Online and OneDrive for Business can spread ransomware among multiple systems, users, and shared documents. Ransomware is not similar to other types of malware. It will encrypt users files or lock down the system. Infected end-user machines will receive a message that their data have ransomware virus. In such situations, hackers demand payment in cryptocurrency to unlock or release the system and data of victims. However, there is no any guarantee that the hacker has not damaged your data or they will return control to your organization. Users data may destroy and inaccessible even after ransom has been paid. There are 4,000 ransomware attacks happen per day in any organization. But, there is no silver bullet or single Office 365 Security solution available to protect your Office 365 data. The three highlighted pillars below are most crucial and necessary evaluation. How to Protect Office 365 Users from Ransomware Attack? There are many recommendations to protect Office 365 data from ransomware threat. Users must have security awareness and education. If users are able to identify security attacks such as ransomware, then they will be less affected by such threats. Installing an anti-virus such as Windows Defender and keeping it up to date. It will prevent many instances of ransomware and malware from affecting your organization. Enable cloud-based Microsoft Active Protection Service. It provides higher malware protection through cloud-delivered malware blocking decisions. Beware of Phishing emails and Malicious attachments like exe, js, vbs, and ps or Office document types that support macros like DOC, XLS or XLM. Enable the file history or system protection for future perspective. If users will face ransomware attack, then ensure that they are able to recover the files by using the file history. Manually, it is very hard to prevent the data from the ransomware attack. Therefore, a Direct Solution to Office 365 Ransomware Protection is advised to use backup solutions by SysTools. This is the best solution to protect Office 365 data from Ransomware attack in any organization. It provides simple and user-friendly interfaces that even a novice user can use it without taking any expert help. It also saves users time and effort. As it is discussed, Ransomware virus is very dangerous for any organization. So, all users want to protect their system, data, file etc from this threat. For preventing Ransomware attacks, manual solution is not the best approach. It has many limitations. Therefore, it is recommended to use the third-party tool for a better result. 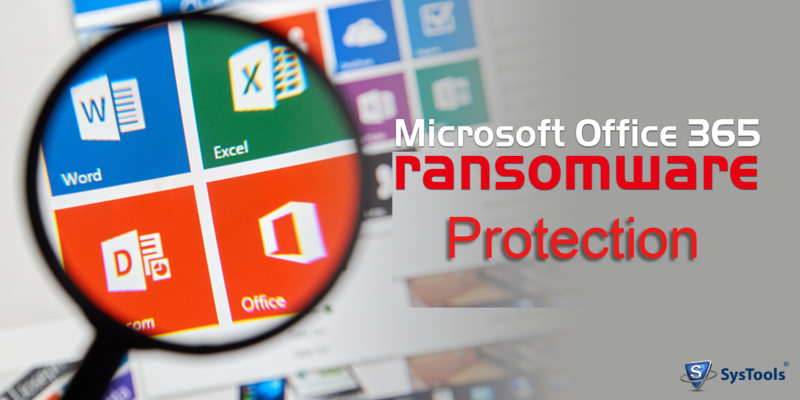 Because Office 365 Ransomware Protection is must for any company to save their sensitive data.